Ring Wars Carolina is ALWAYS providing men and women a chance to reach their goals in the wrestling world by providing a place to train, learn and grow in this business. RWC has never claimed to know everything in the wrestling business. RWC always encourages our students to seek out wisdom and knowledge from any vet and/or experienced professional. 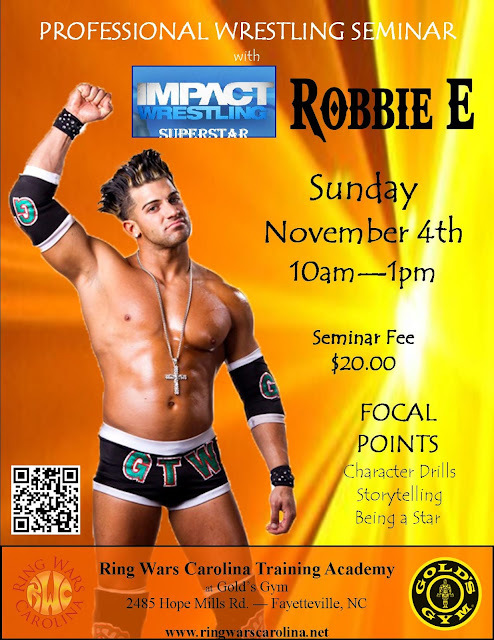 RWC is proud to present to you Former TNA X-Division Champion, TNA TV Champion and TNA Impact Superstar Robbie E! Mr E. will be conducting a training seminar at Golds Gym in Hope Mills, NC on Sunday, November 4, 2012 from 10 am to 1 pm. The focal points will be Character Drills, Storytelling, being a star! This is open to aspiring athletes to veterans looking to get to the next level. All this for the low price of $20 dollars(RWC trainee rate). We don't keep the good training to ourselves like some other companies, we try to share to the knowledge to better the business! Come out and learn from one of the best in the business right now! key words there guys is "In the business right now"! GET YOUR NAME ON THE LIST BRO! Email rwcoffice@hotmail.com to reserve your slot.